A delightful anthology of Polynesian, Melanesian and American Indian events and performance pieces selected and adapted by the well-known poet, translator and editor. Jerome Rothenberg was born in New York City in 1931, the son of Morris and Estelle Lichtenstien Rothenberg. He graduated from the City College of New York in 1952 and the following year received a Master's Degree in Literature from the University of Michigan. He spent the years 1953-1955 in the U.S. Army, stationed in Mainz, Germany, and returned for further graduate studies at Columbia University from 1956 to 1959. Rothenberg's first published work, a group of translations from the German, appeared in the Winter 1957 issue of The Hudson Review. In 1958 Lawrence Ferlinghetti asked Rothenberg to translate a collection of postwar German poetry, which City Lights Books published in 1959 as New Young German Poets. This work marked the first appearance in English of such poets as Paul Celan, Gunter Grass, and Ingeborg Bachman. In 1958 Rothenberg founded Hawk's Well Press, which published early works by Robert Kelly, Diane Wakoski, Armand Schwerner, and Rochelle Owens, as well as Rothenberg's first book of poems, White Sun Black Sun. As an adjunct to these activities, Rothenberg edited the magazine Poems from the Floating World, which included new works by poets Jackson Mac Low, Robert Bly, Denise Levertov, Paul Blackburn, Gary Snyder, and Robert Duncan. The magazine was superseded in 1965 by Some/Thing, co-edited with David Antin. Rothenberg's works during this period reflect his experimentation with image in White Sun Black Sun (1960) and attempts at thematic enlargement in The Seven Hells of the Jigoku Zoshi (1962) to experiments with silences and disjunctions in Sightings (1964) to further explorations of alternate poetic structures, uses of found poetry and collage, development of forms suggested by Gertrude Stein's work, experiments with dialogue and narrative that mark The Gorky Poems (1966), Conversations (1968), and Poems 1964-1967. These concerns and the connections between them were presented in Rothenberg's next work, Poems for the Game of Silence (1970). Rothenberg's concern for the relationship between "primitive" and modern poetry led to the development of an anthology of primitive and archaic poetry, Technicians of the Sacred (1968). This work attempted to redefine the range of primitive poetry, presenting not only words of songs, but picture poems, sound poetry, naming poems, dreams and visions and scenarios of ritual-events. With the completion of this work, Rothenberg directed his attention to ethnopoetics and began a study of Senecan Indian songs at the the Allegheny Reservation in Steamburg, New York. In 1968 Rothenberg received a grant from the Wenner-Gren Foundation in Anthropological Research to conduct a two-part experiment in the translation of American Indian poetry. The project involved a collaborative translation between Rothenberg and Seneca songmen and the translation of a series of Navajo horse-blessing songs. In this effort, Rothenberg began to develop an approach he termed "total translation," meaning that he accounted in the English version for every element in the original language, including the so-called "meaningless" vocables, word distortions and redundancies. This close study and involvement with American Indian poetry and ritual promoted the development of Rothenberg's next anthology, Shaking the Pumpkin: Traditional Poetry of the Indian North Americas (1972). Rothenberg's interest in American Indian and other tribal/oral poetries led to the development of a magazine, Alcheringa, the first periodical devoted exclusively to ethnopoetics which he co-edited with Dennis Tedlock from 1970-1976. Concurrent with this interest, Rothenberg began exploring his own ancestral themes and the lost world of Jewish Poland in a series of poems which culminated in A Book of Testimony (1971), Esther K. Comes to America (1973), and Poland/1931 (1974). With George Quasha, Rothenberg published America A Prophecy in 1974. The intent of this anthology was to redefine the past and present of American poetry over an expanse of time and cultures. Also in that year he received a Guggenheim Fellowship, and in 1976 a grant from the National Endowment for the Arts. In 1978 Rothenberg published A Big Jewish Book: Poems and Other Visions of the Jews from Tribal Times to the Present. Co-edited with Harris Lenowitz and Charles Doria, this volume broke new ground in the fields of poetry and history. 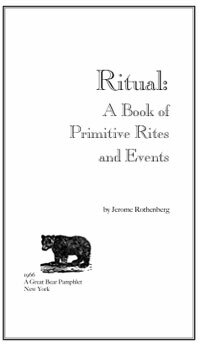 The book provides a unique history/anthology of Jewish consciousness in the form of poetry and oral traditions. For the book, Rothenberg drew on both sacred and secular sources, with the link between them emphasizing the poetic/visionary continuum and the mystical and magical side of the Jewish tradition. To document the entire range of the Jewish poetry tradition, Rothenberg divided the book into three sections which explore the mythic, historic, and poetic themes of Jewish poetry. Many of the works contained were newly translated or uncovered. Rothenberg's next major anthology, Symposium of the Whole: A Range of Discourse Toward An Ethnopoetics, co-edited with Diane Rothenberg, appeared in 1983. This book traces an ongoing course of work and thought on poetry and culture that has influenced the art of modern times. Symposium follows the concept of ethnopoetics from the writings of predecessors such as Vico, Blake, Thoreau, and Tzara to more recent essays and manifestos by poets and social thinkers, including Olson, Eliade, Snyder, and Baraka. The work is unique in its vision and scope, addressing both poetics and politics. Since 1960, Rothenberg has served as an instructor at various colleges and universities, including: the City College of New York (1960-1961); the Mannes College of Music, New York City (1961-1970); the Universityof California, San Diego (Regents' Professor, 1971); the New School for Social Research (1971-1972); the University of Wisconsin, Milwaukee (1974-1976); San Diego State University (1976-1977); the University of California, San Diego (1977-1985); SUNY Albany (Writer in Residence, 1986); SUNY Binghampton (1986-1988); and the University of California, San Diego (1988- ). Finally, Rothenberg has translated work by Paul Celan, Hans Magnus Enzensberger, Eugen Gomringer, Rolf Hochhuth, Garcia Lorca, Kurt Schwitters and many other European writers into English. In 1968 Rothenberg received a Wenner-Gren Foundation grant for the experimental translation of American Indian poetry. Rothenberg's own selected poetry, Poems for the Game of Silence, has appeared in French, Swedish, and Flemish/Dutch editions, and his work has been extensively translated into Spanish, Dutch, Italian, German, Serbian, and Finnish.